Herpes Labialis is commonly known as a cold sore or fever blisters. The lesion that forms on the lip is caused by the Herpes virus. The virus lies dormant inside a nerve cell and when released into the surrounding tissues it causes the lesion. The lesion is formed by the destruction of skin cells as they are burst from the virus particles. Unlike most viral infections Herpes outbreaks reoccur with regular frequency. Although there are many and different reasons that will cause outbreaks amongst different people, trauma seems to be the most common. Amongst trauma sunburn is the most common. Stress is another contributing factor. Most people will get a tingling or burning sensation in the area where a lesion is about to form. Valtrex or Acyclovir is very helpful at this stage of development to minimize the lesion and expedite healing. For some who have very high recurrence rates, Acyclovir can be taken daily to suppress or minimize the number of outbreaks. Another option is the use of laser energy. Lesions which are treated with the laser rarely reoccur. The mechanism by which laser treatment suppress recurrent outbreaks is not fully understood. I surmise that somehow laser treated lip tissue is altered so that it doesn’t conduct typical stimuli that would normally cause the release of virus particles or, more unlikely, its able to eradicate virus particles from the nerve cell itself. Patients who have been treated with the laser do not report any difference in sensation with the treated area. There is no numbness or altered sensation of the lip tissue. 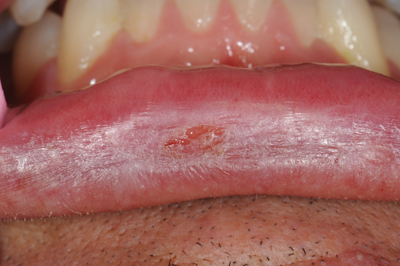 Lesions typically show up in the same location of the lip. Treating one lesion does not change the outbreak frequency of other lesions. They must be treated as well. Once the lesion is treated, with the laser, it becomes asymptomatic, meaning that the pain and discomfort stop immediately. 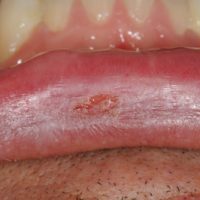 Laser treated lesions take 4-6 days to heal and there is rarely any scarring or visible evidence that the procedure was completed once the lip heals. Lesions that to recur after laser treatment are smaller and can be retreated. I use a CO2 laser in my practice, but other laser manufacturers are reporting the same findings using YAG and Diode lasers as well. The following slide carousel shows a forming lesion, which is then treated with the laser. The resulting scab is usually lost withing a couple of days. Chap stick or petroleum jelly should be on the laser treated area while it is healing. Post surgical pain is typically relieved with Ibuprofen. I am not certain what the wattage would be diode laser, but I would start at low power. The lesion will begin to foam. Wipe this away with dampened gauze and repeat this layer by layer until lesion is removed. I typically remove one layer beyond that. If the lesion extends on the facial skin beyond the lip mucosa be conservative in that part of the lesion as it can leave a reddened area that will eventually fade with time but can take longer than just letting the herpes lesion run its natural course. I hope that helps. I Acquired herpes in 2008. When it appeared, it started with a white pimple that I popped. After that, it was all down hill. It appeared before my very eye’s. All red, and messy. It had a 4 dot pattern. I didn’t get another outbreak until 2 and a half years later. It was no where near as bad as the first time. Then 3 years 8 months later( just recently) I had another out break which was only a little bump you could hardly see. I don’t understand this, does it get weaker as time goes by? The primary outbreak of Herpes is usually the worst one. Following that they are more mild but proportional to the amount of trauma that caused the outbreak. The frequency of outbreaks seems to be the most pressing issue. People who have frequent outbreaks are good candidates for Laser treatment as it usually reduces the frequency of outbreaks and in some cases there is no recurrence.